The Washington Times. April 26, 2011. My favorite daily reading has long been of the obituaries of World War II veterans that are almost a daily feature in the London Daily Telegraph. For some years past, they have provided me a seemingly endless supply of fascinating stories about the often astonishingly courageous deeds of men who were decorated for valor in that war. There are fewer of them now as the ranks of these old warriors are further thinned and as we grow more and more distant in time from the culture that, whatever its faults, was able to produce men of such caliber. The only way to understand the present is in terms of the past. 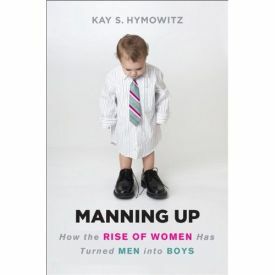 My apologies if that seems either obviously true or obviously untrue, but it is the foundational axiom on which Kay Hymowitz’s "Manning Up" is based. To a generation of young males for whom the study of history has been optional, at best, there can be nothing very remarkable about the fact that so many of them while in their 20s or even 30s, instead of risking their lives in the service of their country, or even getting a job and getting married as young men in peacetime have for centuries been eager to do, are unemployed and/or still living with their parents. It is only by comparing their lives to those of their fathers and grandfathers, many of whom at their age had commanded men in battle and most of whom were married and had children of their own, that those of us old enough to remember such men find anything untoward. Playing the devil’s advocate, I could remark that this is the answer that Ms. Hymowitz’s critics could make to her devastating critique of the infantilization of our culture and the rise of what she calls "preadulthood," especially among young males: Yeah? So what? Where is it written that "growing up," as the term was understood by those bound by economic circumstance or social expectation a generation or more ago - let alone the sexist-sounding "manning up" - is compulsory? Times change. There are no Nazis to defeat, the parental units have plenty of money and the girls are compliant without expecting you to marry them. Deal with it, Kay Hymowitz. Man up. Yet such critics are, I believe, mistaken. The kids are not all right and they may even be not immune to the shame of their long-delayed maturity. If they are boys, they may even be stung by the imputation of weakness, cowardice, dependency and lack of ambition. All of these qualities would have had negative survival value during the millennia of our evolution as Homo sapiens, much of that time spent in perpetual warfare, so it is reasonable to assume that the positive value of the ability to feel shame in idleness and dependency would have been hard-wired into us. The slacker "lifestyle" - like "lifestyle" itself - is therefore a kind of drug that we know is very bad for us, may even be killing us, but that we keep taking anyway because denying that knowledge makes us feel better than acknowledging it. Ms. Hymowitz does a terrific job of anatomizing the problem and setting out its less salubrious social consequences, but she is a little too shy about attacking its causes. On the last page of text, she gets around to this, writing that the "underlying theme of this book is one easily misunderstood by Americans: the limits of individualism. People don’t order or create a meaningful life out of whole cloth. They use the cultural materials available to them. The materials available to young men are meager, and what is available often contradicts itself. At bottom, they are too free." I think this is right, but the social implications of the observation are too tremendous for her to get into in the half a page remaining to her. "Preadulthood is not going away," she writes, and she follows this melancholy but probably all-too-true contention with what sounds like the forced cheerfulness of urging girls "to get a better understanding of the limitations imposed by their bodies" and men to "man up." You can understand why she wants to avoid ending on a note of dejection and despair for the prospects of the race, the nation, the culture and, perhaps, the world. It wouldn’t be good for sales, but it might be more honest. I agree that what she grandly calls the demographic shift toward preadulthood is not going away - not, anyway, so long as moralists like herself pull their punches because they are more ashamed of their moralizing than the preadults are ashamed of their unwillingness to grow up.